NEWARK, NY- The Amsterdam Mohawks won the 2014 PGCBL Championship with a 12-1 win over the Newark Pilots at Colburn Park. For the Mohawks, it is their third straight PGCBL championship. 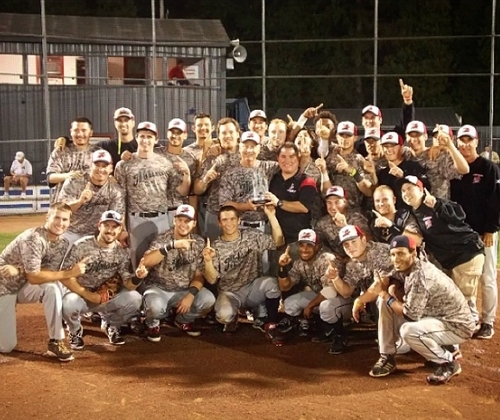 In the four years of the PGCBL, the Mohawks have won the championship every year, except for the inaugural season of 2011 in which they were defeated by Newark. Amsterdam got on the scoreboard early and often en route to the win. In the first inning, Marcus Carson hit the first pitch of the game for a double and was then driven in on an RBI single by Kentucky teammate JaVon Shelby. Later in the inning with the bases loaded, Alex DeBellis was hit by a pitch to score the second run of the inning. After both Logan Boyher and Tim Lewis singled with one out in the bottom of the inning and advanced on a double steal, Austin Clock hit a sacrifice fly to center field to bring Newark within one. The Mohawks quickly got two runs back in the next half inning. JaVon Shelby again drove in Marcus Carson, this time with an RBI double. Shelby then came around to score on a Josh Gardiner RBI single. The big inning for Amsterdam came in the fourth inning, when the visitors put up a six spot to break the game open. Tommy Kain kept up his hot hitting with a bases-loaded, bases-clearing double. Fellow Lynn teammate Alex DeBellis brought him in with an RBI single, Blake Logan picked up his first RBI of the night with a single and Brendan Tracy scored on a throwing error. After four innings, it was 10-1 Amsterdam. Logan’s second RBI of the game came in the sixth inning when he hit an RBI double that scored Tracy. The final run of the 2014 PGCBL season came across in the top of the eighth on another Logan RBI double. Alongside Logan, JaVon Shelby and Marcus Carson each had three hits for coach Keith Griffin. PGCBL Player of the Year Josh Gardiner and Alex DeBellis added two hits. Amsterdam starter and first team All-PGCBL pitcher Taylor Blatch was dominant for the champion Mohawks. Blatch tossed a complete game, struck out nine Pilot batters and allowed six hits. With the Mohawks three outs away from the championship, Blatch allowed two runners to reach, but got Zach Wall to strike out swinging to give Amsterdam back-to-back-to-back championships. Griffin said he considered taking Blatch out of the game, but the right-hander talked the veteran manager into letting him stay in. “It was just a tremendous season. A great group of guys, everybody contributed, it was a team that will be measured in the history of the Perfect Game Collegiate Baseball League,” Griffin said of the record breaking Mohawks. Amsterdam won 36 games during the regular season, topping their own mark of 35 during the 2012 season.